We have the equipment and expertise to help you move mission-critical materials with worry-free consistency across your supply chain and around the world. We create value for our Customers by moving and managing a wide variety of materials in both inland and offshore marine markets—all at the highest safety standards. Our experience transporting, loading and unloading, and managing vessels of any size means your cargo arrives where you need it, when you need it—safely, and with complete visibility. We operate several U.S. flagged offshore vessels built to Jones Act trade standards, including one of the world’s largest liquid-sulphur vessels, the Sulphur Enterprise, which carries 25,000 tons of cargo and transports approximately 1.6 million tons per year of sulphur across the Gulf of Mexico. 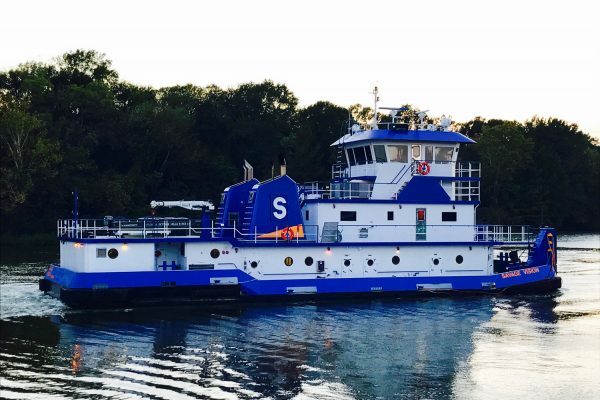 We also operate the state-of-the-art Abundance/Harvest articulated tug and barge (ATB), which can carry 22,000 tons of anhydrous ammonia and was named one of WorkBoat’s 10 Significant Boats of 2017. Savage Marine Management is an approved unlimited tonnage/any oceans operator with ISM certification from the American Bureau of Shipping (ABS) and uses ABS Nautical Systems’ fleet management software. View Savage Marine Management Company’s Safety and Environmental Protection Policy. Regardless of the material, our experience moving, managing, loading and unloading vessels of any size and in any type of waterway means that you get your product where you need it, when you need it.